We made this for the fist time with our friends in Cambria, CA…and we all LOVED it! This would be a great dish to take to a potluck…it doesn’t scream “RAW” 🙂 But it is amazingly tasty and addictive. I kept going back for more. There is just something about the mixture of sweet and sour that I love. Place the cabbage, carrots, and apricots in a large bowl. In a small bowl, mix the rest of the ingredients except the raisins and pour over the cabbage mixture. Cover and let sit for 1 hour. This is an important step…as it will help soften the cabbage a bit. Mix in raisins just before serving. Mmmm. I will look forward to making this one! I use raw honey…but either would work. Wow! I think this is something even I could make!!!! Off the the markey to get me some cabbage! YUM! We are going to a BBQ tonight, this will be great! Thank you! I so appreciate all the recipes you post! Most of them I have tried have become keepers. You have inspired me to share more recipes on my blog as well. I just posted two raw salads that I love tonight and since I think that our taste buds like similar tastes, I want to invite you to check them out! You can let me know if my assumption is right! Peace! I had all the ingredients on hand so I made this last night. I’m eating it for lunch right now and it’s delicious! Thank you! I have been drinking green smoothies for a couple of months now and am trying to go more and more raw. I have never been healthier and I can’t stop talking about how this change has affected me. I am fairly new to your blogs and I have been totally inspired by them. I can’t stop reading your archives. I live in Ankeny so I am even more inspired knowing you lived in Des Moines. I wish I could talk my husband into doing what you are doing! I made this last night, and boy was it yummy! Your recipes and food pirctures look so yummy! I have a question….We don’t have a health food store close by and I don’t like to order online, can I use the packaged nuts from the grocerey store (usually found in the baking aisle) in place of the raw nuts called for in your recipes? 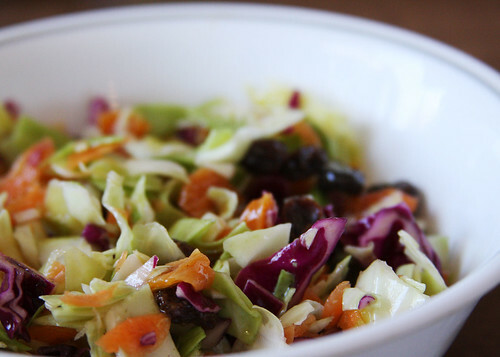 The best thing about this slaw is that it only gets better after a day or two in the fridge. All the flavors mix & mingle — yum. I used apples instead of apricots and added beets — it was great. I’m new to this blog — thanks for being a great resource for us out here! Can I use sugar instead of the honey. If so, how much sugar? ?